As with our Marathon, The Purbeck 16 is actually more than 16 miles and is in fact closer to 16.5 miles and is a great step up from a half marathon. 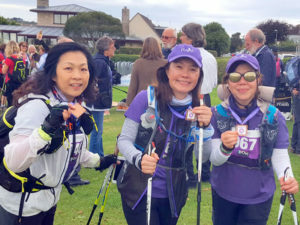 Enjoy a day nordic walking along the Jurassic Coast with other keen nordic walkers and challenge yourself to complete this route which took the running world by storm due to the amazing scenery and challenging terrain. There will be prizes for the first Male and Female finishers but everybody who completes the challenge will get both a medal and a T shirt plus the satisfaction of taking part in an event that is sure to grow year on year. Put those nordic walking poles to good use too because this is a charity event with ALL proceeds going to great local causes. There will be Marshalls and drink stations en route but this is not a lead walk and you do need to carry energy food, drinks and basic kit to keep you comfortable and safe. The Purbeck 16 starts and finishes in Swanage. From the Downs overlooking the beach, it heads towards Durlston Country Park and along the Jurassic coast path before going through the villages of Worth Matravers and Kingston. 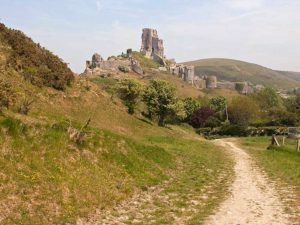 This is where the route separates from the Marathon and cuts across heathland towards Corfe Castle and meets up with the Marathon Route on the common. The route then picks returns to the hill Ridgeway and heads towards Swanage to finish on the seafront. The entire route has spectacular views which will help to combat fatigue. Weather permitting there will also be stunning views of Portland, Poole Harbour and the Isle of Wight. Just like The Purbeck Marathon, The Purbeck 16 is a local community event and the proceeds will be distributed to local charities. Just like the marathon this is more than just a 16 mile race, it’s a Purbeck 16.